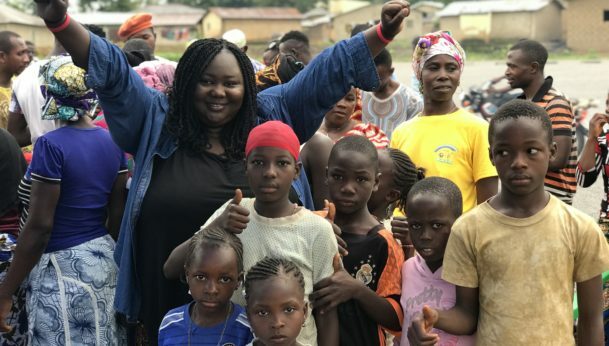 This past summer, thanks to the support of the Wallace Global Fund, my sister Mariama and I traveled to the Republic of Guinea to continue the Break The Silence community outreach to end female genital mutilation (FGM). During this trip, I filmed a documentary with the German Channel Deutsche Welle (DW) as part of their #DigitalWarriors series. This trip and the process of capturing this documentary was one of the hardest things I have done in my life. My team and I worked tirelessly because we know that this period—the vacation cutting season—is a time when girls are at the greatest risks of being cut. While in Conakry, I walked in front of the house where I was cut. I couldn’t go into the house; it’s still too hard to do so. I also learned for the first time my mother and grandmother’s FGM stories. I am still processing what they told me and the feeling I had visiting that house again. Our visit to Guinea coincided with political unrest and violent strikes in the country. Yet, we had to travel to remote villages we serve in the regions. I couldn’t make the decision for everyone so we had to discuss the risks. The conversation was somber because we knew that we were potentially putting our lives on the line by deciding to get into the cars. We decided to do it! I felt a mix of emotions—I was worried for the team but I felt so much pride to work with literal “heroes”—people who were willing to risk their safety to help protect others. We traveled more than 12 hours by dangerous roads and under heavy rain. We faced car troubles and one of our drivers became gravely ill while being tens of miles away from help. We ate food we found at makeshift markets and traveled in pitch darkness. We were not deterred by these conditions. We still kept moving fueled by our mission. Finally, we reached the remote villages we serve—Yende and Walto! We were welcomed by the beautiful songs of the women and girls we serve. In those moments, we forgot all the hardship we had faced. We watched as these communities renounced the practice and removed the secrecy of FGM by showing, in public, the tradition of cutting. I had the opportunity to speak with cutters and religious leaders to activate them in breaking their silence. Finally, we proudly witnessed young girls speaking out against FGM through theater skits— they were teaching their communities about their rights. I came back to New York City and continued our advocacy work. Then, last week, a District Judge said that the law to ban FGM in the U.S. was unconstitutional. At first, I felt angry. I felt alone. I felt broken. But this moment did not last because I remembered the work that is happening globally. I swore to myself to push even harder for change and to never allow the voices of women and girls to be silenced. I vowed to break the silence. You can read our statement here. Today, millions of people will learn about FGM and the Break The Silence movement as the #DigitalWarriors documentary premiers in Germany and other countries. More than 50,000 people have also watched the film on Youtube and on other social media platforms. This is just the beginning. We are not going to stop. But my team and I cannot do it alone. We need you. Donate to support our work and pledge to help end FGM. You can also tweet using the hashtag #BREAKTHESILENCE and tagging @thereisnolimitf.